The best glue for sticking table tennis rubbers to the blade is Butterfly Free Chack. Butterfly Free Chack Glue is made in Japan. This glue is free from organic solvents and is made from natural rubber (or 100% Liquidized natural caoutchouc). You can use it to stick any ping pong rubbers to a ping pong blade. After a short drying time, it sticks the rubber and the blade surface together perfectly. The most important part about this glue is that it is also very easy to remove the rubber from the blade. You can also clean off the remaining glue quickly. This particular product also comes with fifteen sponges and an applicator to apply the glue. Trust me the applicator is very useful. The sponges are there to evenly spread the glue around on the blade and the sponge.One complaint I have heard for this glue is that it is hard to remove if it is used to stick the DHS Hurricane sponge. There are over 50 4.5 star reviews for this glue on Amazon. One complaint I have heard for this glue is that it is hard to remove if it is used to stick the DHS Hurricane sponge. There are over 50 4.5 star reviews for this glue on Amazon. 80% of the reviews were five stars. Folks this is a glue that works and works well. I think the other complaint is that it is slightly expensive but I think that’s fine. You save money by assembling your own awesome racket. 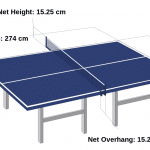 My recommendation is to use Timo Ball ALC blade and Tenergy 05 rubbers to create an awesome ping pong racket. And use this glue to stick them together. You will have a great racket for offensive spin and speed with that combination. A lot of professionals use that setup. This video shows step by step how to use the Butterfly Chack glue to stick a ping pong rubber onto a ping pong paddle in less than three minutes. We hope you like this review of best table tennis glue. For our other reviews, please see the relevant article titles and links below.